Bangkok is not a destination that you would normally associate with art and culture centres. 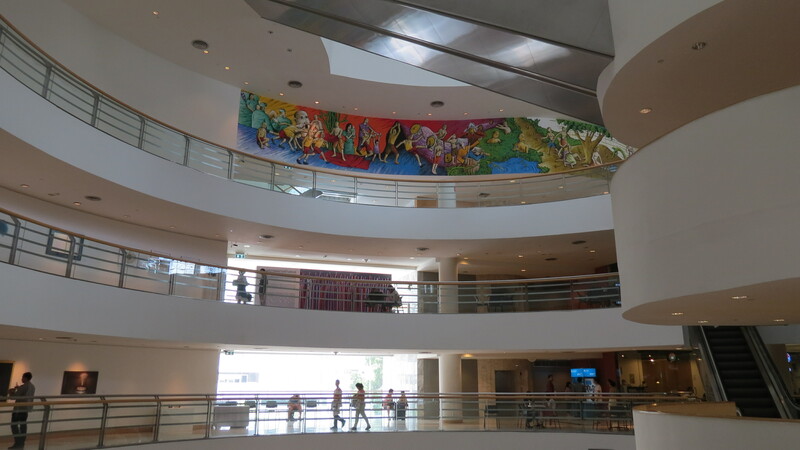 But there are quite a few dotted over the city, so I decided to put my cultural hat on and visit the Bangkok Art and Culture Centre and I was happy I did, it is well worth a visit. The centre is located at National Stadium BTS stop and opposite MBK centre, so you can’t really miss it. I got off the BTS at Ratchthwei and walked back towards the centre and was almost disappointed when I saw that there was scaffolding all over it and barriers surrounding it. I thought it was closed but I walked around and found the entrance and realised it was open. There are five floors that circle around the main foyer, and on the ground floor there are a couple of coffee shops. The Art Café is a chic little place decorated with beautiful murals and there are easels, magazines to read, and funky jazz tunes playing. On the first couple of floors there are more cafes. Most of them sell crafts or books, and some of them you can go to share ideas, read books, or just have a coffee. There are also little stalls selling homemade jewellery and handicrafts, and there were painters painting caricature portraits. There are ice cream cafes which sell a weird and wonderful range of flavours- cigarette (yuk), wasabi and global warming??!! On the second floor there are a couple of rooms displaying different art and one of the exhibitions was the “Illusion of the Human Body”. Large painted canvases showing parts of the body stitched together. It was meant to represent how people turn to plastic surgery to achieve beauty when there is natural beauty in everyone. Wandering up and around the floors there was more art- paintings, sculptures and hand-made jewellery displays. Floors seven, eight and nine are used for the main exhibitions with new ones each month. The day that I visited there was only one main exhibition. A collaboration of Thai and British artists called MD III- Monologue, Dialogue. The idea behind this exhibition was fragility and monumentality. The explanation was it illustrates nothing. It is a continuation of a conversation started eight years ago between the artists. “ failure and nothingness are key words in art and ones that can be embraced resulting in fragility and a vision that is unexpected. Monumentality is about presence, and can be about the awkwardness of being”- quote from part of the exhibition. Whether you understand the meaning behind this or not the pieces displayed in the exhibition are impressive. I had to guess at what “The Ghost of Jimmy the Nail” meant. It wasn’t until afterwards when doing some online research that I realised that the cotton sheets were hung in the shape of a nail and there were rusty spots on the sheets, which I think are meant to represent blood. I still haven’t fathomed the meaning, so if anyone knows please enlighten me. The creativity and foresight these artists have is incredible. I am certainly no expert, in fact I would say I know nothing about art , but I was definitely impressed, although a little bemused, at everything I saw there. The centre is open Tuesday to Sunday 10.00am to 9.00pm. Admission is free. Absolutely beautiful place! So it is only three years old. Design is beautiful, and I also love all that space.